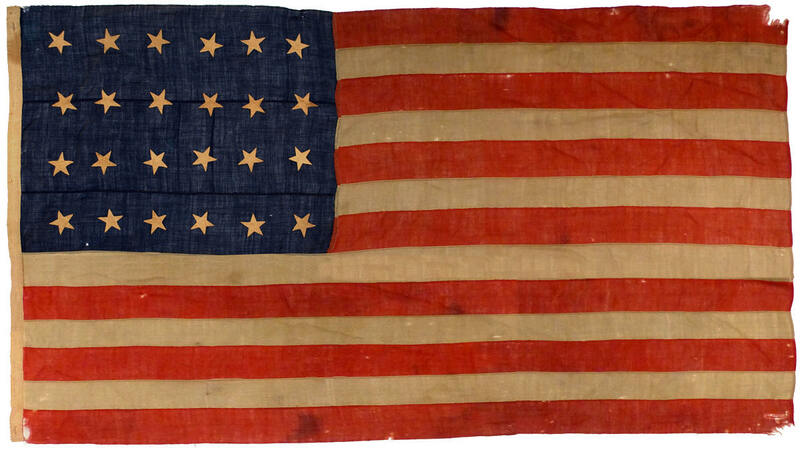 One of my favorite categories of early American flags are the great ship's flags from the 19th century. 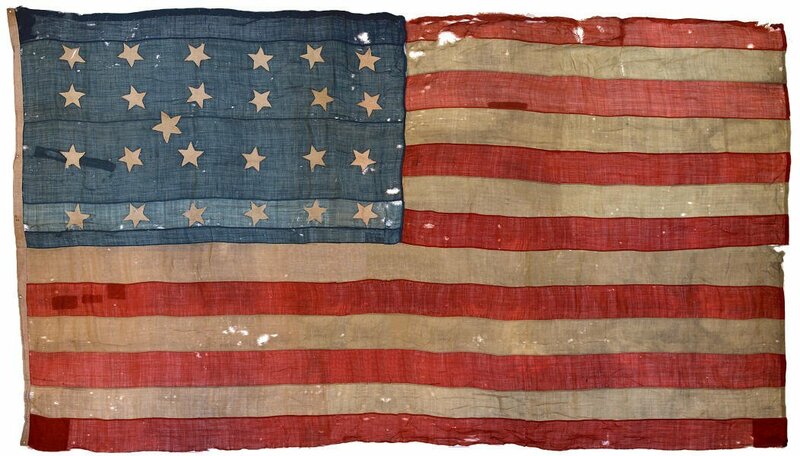 All of these flags, and especially those made prior to the American Civil War, are extremely rare and seldom appear in the marketplace or in public collections. 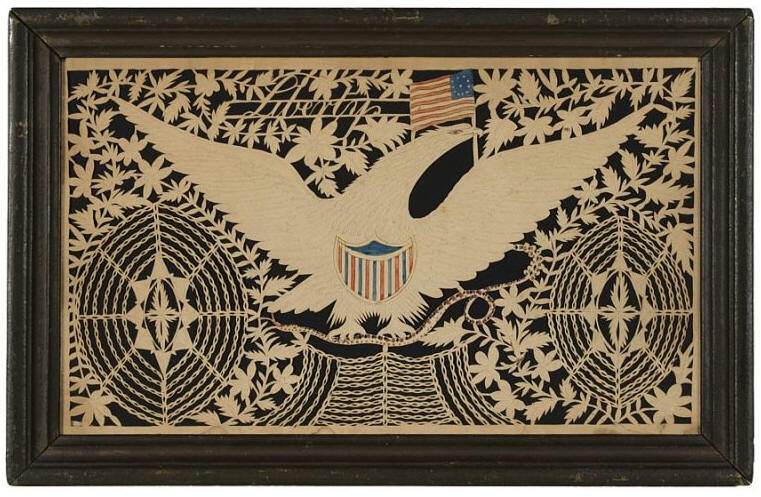 They were made to fly from the great sailing ships of the 19th century, serving as a symbol of America on the high seas and in ports far and wide. 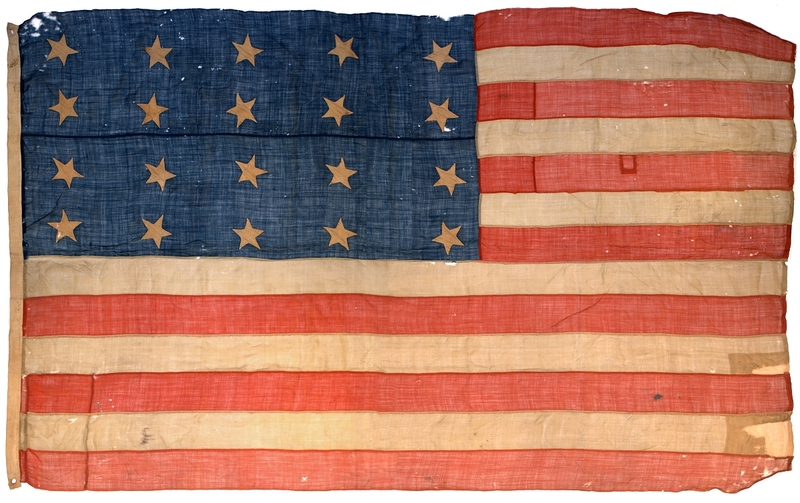 While the great calamity of the Civil War ushered in a wave of patriotism that fueled the personal use of American flags on homes and businesses, use of the American flag from the 1790's through the 1850's was primarily functional, either for maritime and Navy use, or to fly over large military forts such as Ft. McHenry or Ft. Sumter. 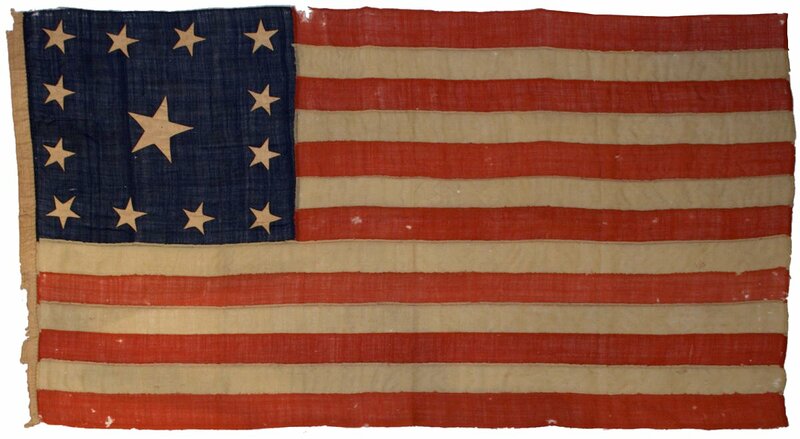 American Army units were not issued stars and stripes American flags until the period of the Mexican War in the mid-1840's. 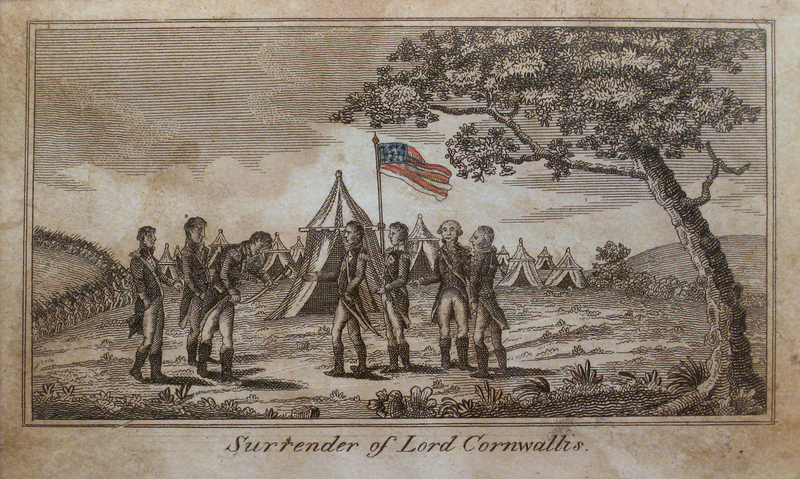 There are many attributes of these flags, beyond their great rarity, that make them extraordinary to behold. They universally have an honest, beautiful wear and look to them. In a way, they simply look like America... their bold colors, hand stitching, make-do patches and repeated repairs, seem to embody the America of hard work, drive, prosperity, and optimism. The selected flags shown below, all entirely hand sewn, form an important and significant sub-collection of early flags within the Rare Flags collection. 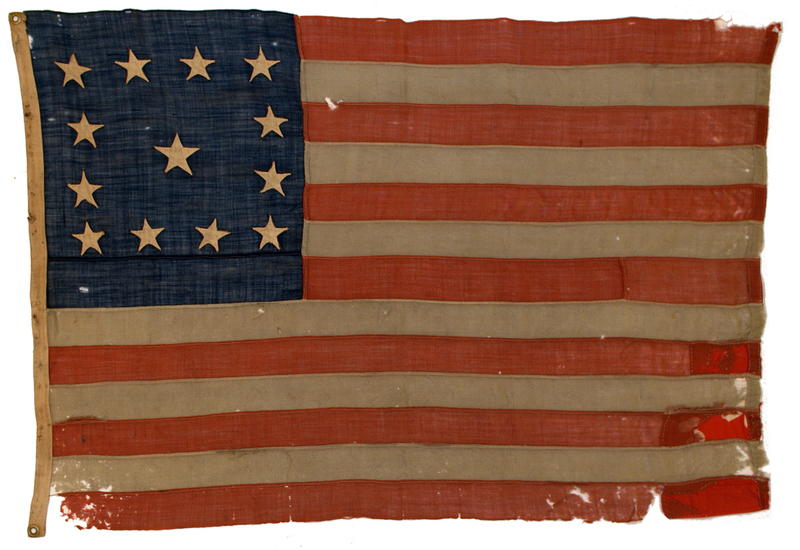 The rare artifacts and patriotic Americana pictured along with the flags are also part of the Rare Flags collection and date from the same period in early America. 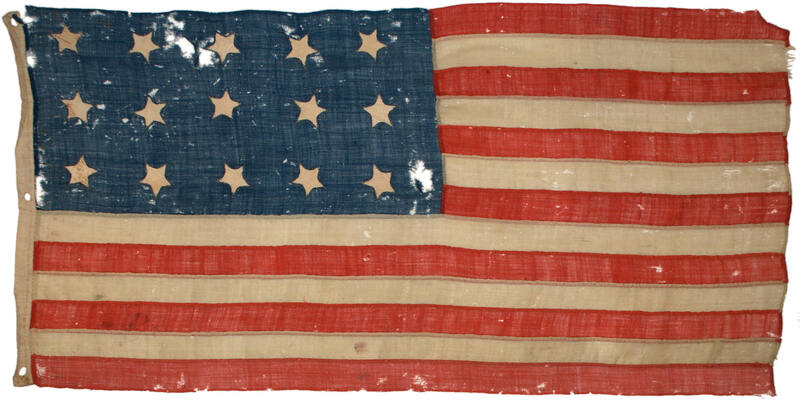 An Original 15 Star Ship's Flag, 1792 to 1818.
thread to protect against rot when exposed to moisture at sea. 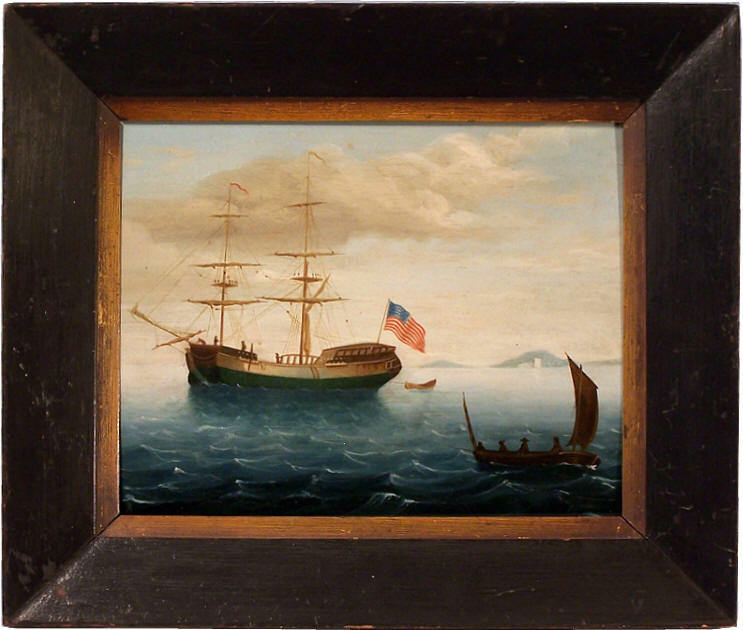 An Early American Oil Painting of the Revolutionary Prison Ship HMS Jersey. The artist, a nephew of a Revolutionary Soldier held prisoner aboard the ship, painted a large ship's flag to commemorate those who died as prisoners aboard the ship. 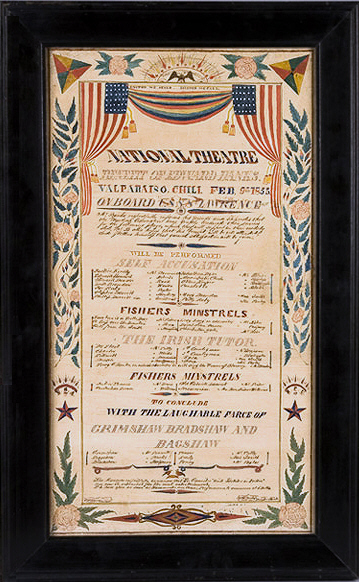 A fanciful watercolor "National Theater" Playbill with two American flags, an American eagle, and the important motto "United We Stand, Divided We Fall". 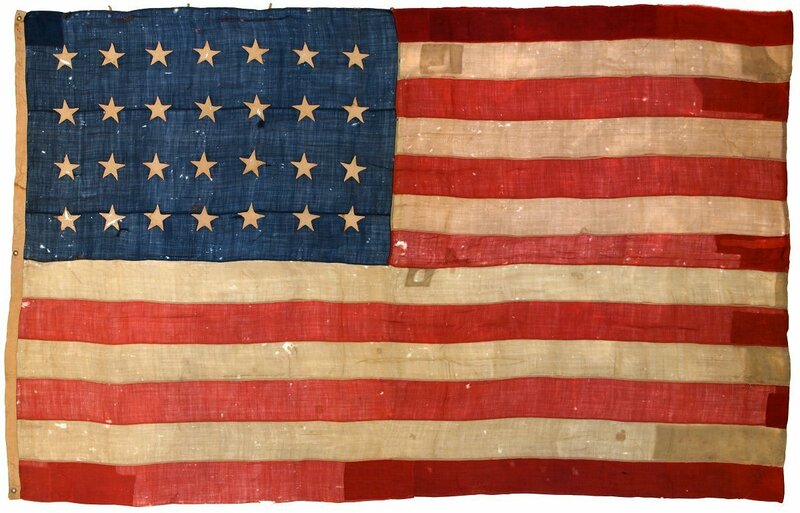 Made by American sailors aboard the USS St. Lawrence, February 9th, 1853, while in port at Valparaiso, Chile. 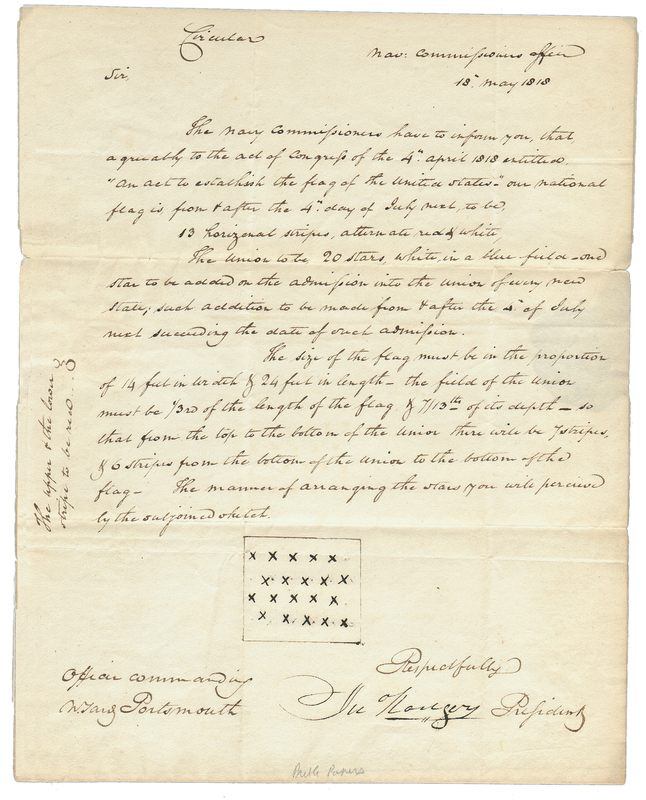 An exceptionally rare star count, made to commemorate Texas statehood. along with a rare 6 Star Navy Commissioning Pennant also from the ship. 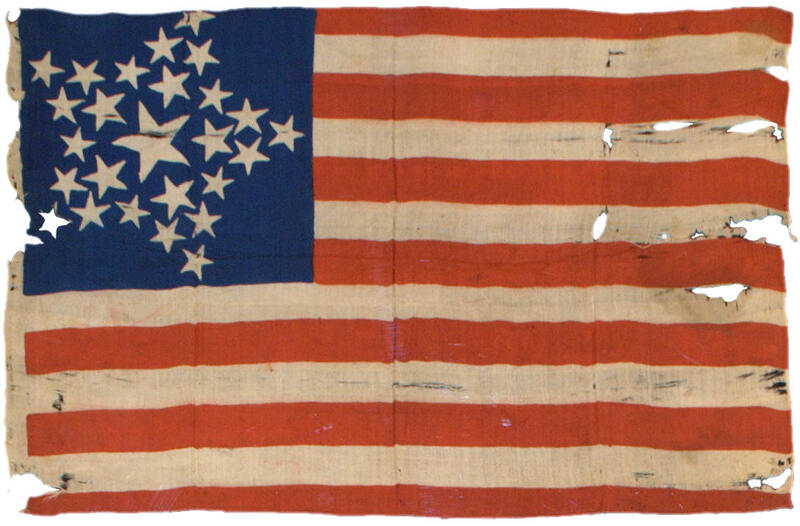 A large mid-19th century ship's flag of 13 Stars in the 4-5-4 Pattern. Although its precise date is unknown, it likely dates to the early-to-mid 19th century. 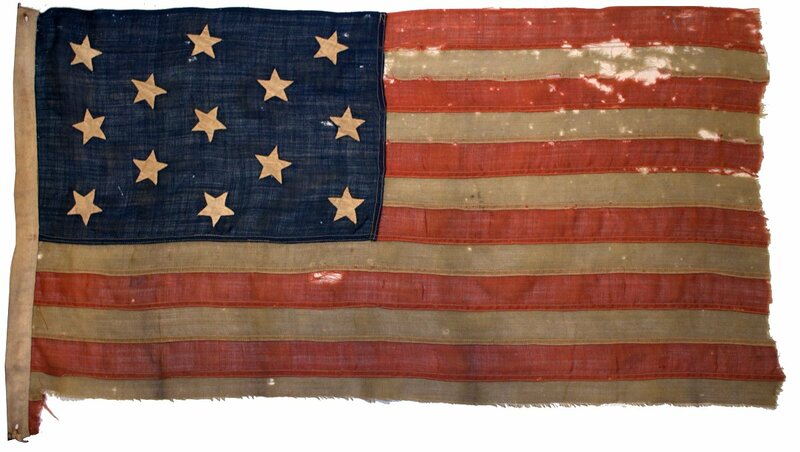 Accompanying history indicates that it it "resembles a Naval flag used by the privateers of 1776" and flew in Kennebunkport, Maine during the Centennial Celebration of 1876. 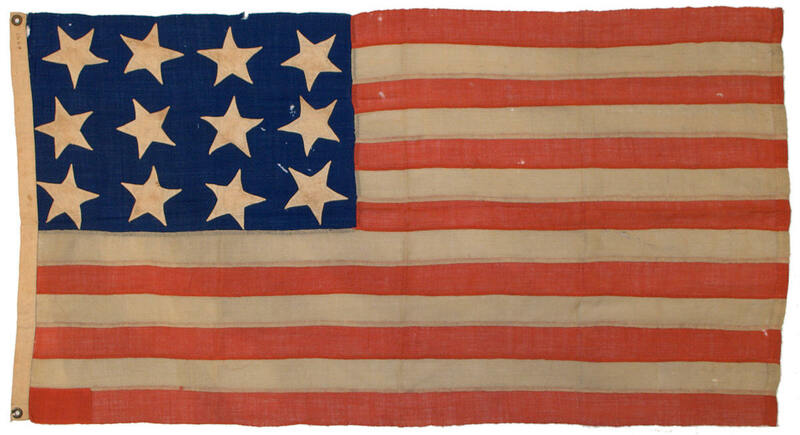 A 13 Star Flag, circa 1845-1860 or earlier, in the very rare Trumbull Pattern, of the style seen in early American ship's paintings, often flown from the stern of sailing vessels in the early- to mid-19th century. 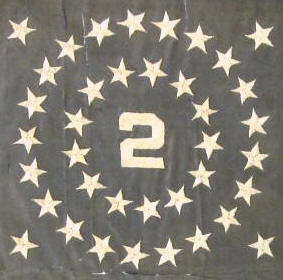 A 13 Star Flag, Civil War Era, in the 3-2-3-2-3 Pattern. 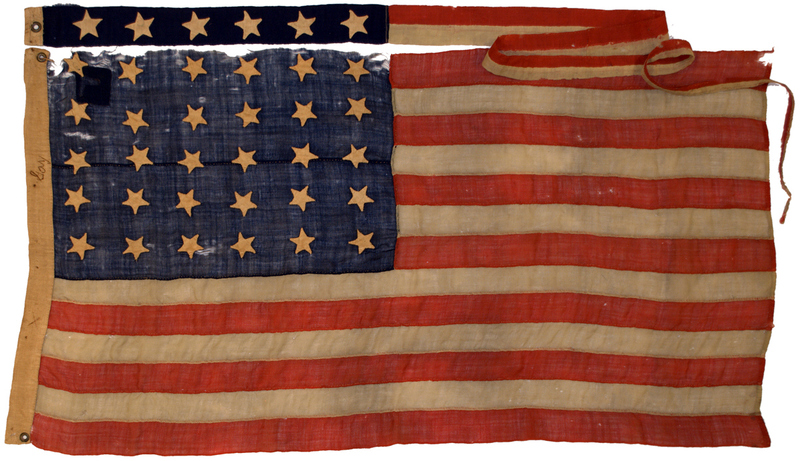 The style of a Small Boat Ensign of the Civil War, with evidence of souveniring of the fly end and bottom stripe, indicative of military service. US Navy Small Boat Flags. 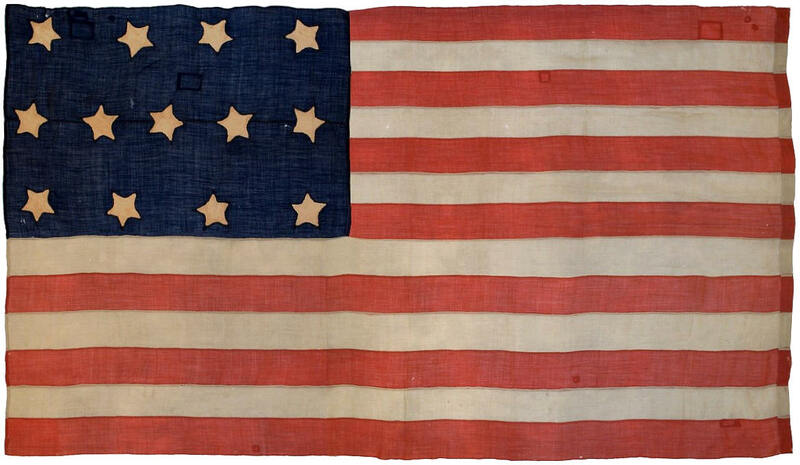 26 Stars, the Great Star Pattern printed on silk, one of the earliest surviving printed American flags, 1837-1845, descended in the family of Commodore Stephen Decatur, US Navy. 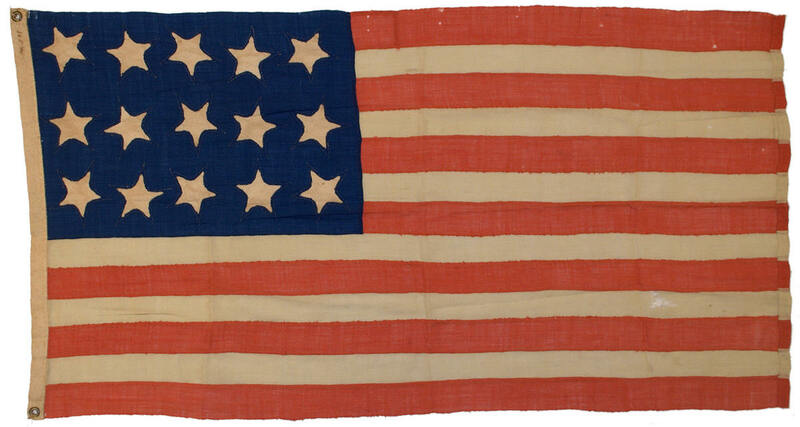 13 Stars in the very rare Trumbull Pattern, circa 1870-1890, descended in the family of a Merchant Marine Ship's Captain.